Tense moments for SOLO students during a mock training scenario. Photo by Peter Lewis, SOLO. Of all the skill sets hikers and other outdoor enthusiasts may possess, backcountry medical training is perhaps the epitome of value. If you hike and spend time in remote locations outside of the “golden hour” (meaning an hour or more from typical urban medical services), dealing with injury or illness at some point — even if it’s not your own — is likely. Getting the proper training will prepare you for this unwelcome eventuality. And do know this: Redline Guiding and SOLO, both, strongly encourage preparedness. To better add to the intrinsic value of this important education, we’re offering a few specially discounted course opportunities so that you may earn your Wilderness First Aid (WFA) certification. In cooperation with the SOLO School of Wilderness Medicine, we are offering a handful of WFA classes this summer and fall. What follows is the information you’ll need to take advantage of this while you can. We really want you to do this. You learn, everyone wins. Earn your WFA credential this year and be a better hiker and outdoorsman. 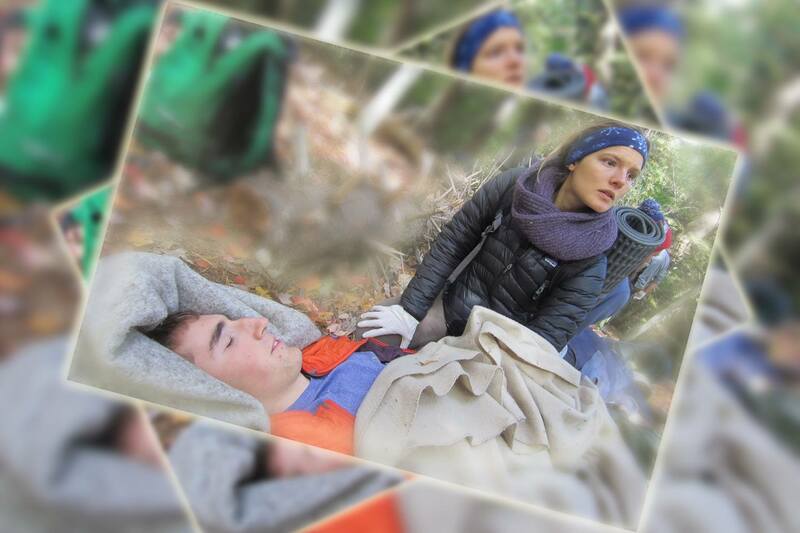 Wilderness First Aid (WFA) is SOLO’s most popular course and it creates a solid foundation in the basics of backcountry medical care. Started as the “Mountain/Woods First Aid” course in 1975, this was the first course of its kind in the United States, and it is the curriculum upon which all other backcountry medicine courses are based. Check out this page at SOLO for more course specifics. You can also contact us here at Redline Guiding with any questions you may have. Ask us for our thoughts about SOLO and the value of the material they teach. Open enrollment, co-ed, ages 12 and up (please see *note below about children). » When are the classes? We still have openings for our November 11th-12th course. » Where is it held? These classes will be held on the SOLO campus in Conway (Madison), NH (directions). » How long is it? Two full days (16 hours), plus two evening hours if taking the optional CPR/AED course. Only $149 per person for the WFA course (reg. $175), plus $35 for the optional CPR/AED course. *Note about children: Minimum age is 12, but please note that this is an adult class so all minor children must be: 1) accompanied by a responsible paying adult; 2) able to behave in an adult-like manner that will not be disruptive to other students; 3) able to test the same as an adult in order to receive course certification. Important Disclaimer: Class sizes range from 10 to 32 students per date given. If the minimum is not met on any date, we reserve the right to end the offer on said date. In such a case, your deposit will be promptly refunded with our apologies. Aside from this exception, deposits are non-refundable inside of 30 days of the course date. This event has expired. Don’t worry, though, we have more.